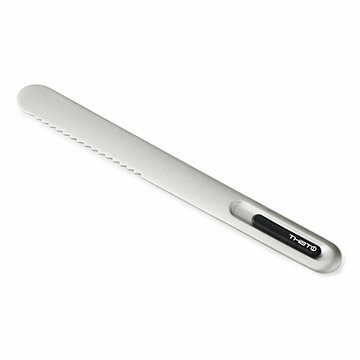 Stubborn blocks of cold butter are no match for this clever, heat-conducting knife. Stubborn blocks of cold butter are no match for this clever, heat-conducting knife. It absorbs the natural heat from your hand and puts it to work on any rock hard, frozen food that you want to enjoy without waiting for it to soften up--cream cheese, ice cream cake, frozen coconut oil, frozen bagels, and more. With its serrated edge and food-safe titanium coating, this amazing knife even cuts through solid ice. Made in Taiwan. Pair your Heat Conducting Knife with our Heat Conducting Scoop. This is a pretty little thing and I love leaving it out with my butter. However, I do not see that it conducts heat any better than any other metal knife, and the serration works about the same as any serrated knife does. Nothing special ... except in the looks department. We use it like a regular butter knife - but it is more interesting. I really love this product. How often do you forget to take butter out of the refrigerator (in my case, the freezer) and then you have to wait to use it or chance it in the microwave where you may over heat it? This is simple to use, cleans fast, and I consider it a great gift as well as an unusual one, for that cook in your life. Works really well even on ice cream cake.